Planning on visiting the Alice C. Sabatini Gallery between Wednesday, Jan. 28 and March 15? You might want to take a deep breath before entering. The exhibit inside, called InCiteful Clay, isn’t for everyone. 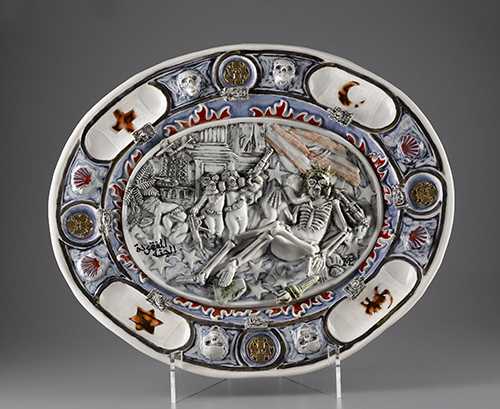 Michelle Erickson, Paradise Lost, 2008, cast and hand-built porcelain with metallic and enamel underglaze and decal transfers, 18 x 24 x 6 inches, courtesy the artist. InCiteful Clay features pieces by 26 national artists and all of them are ceramics (hence the name of the exhibit). 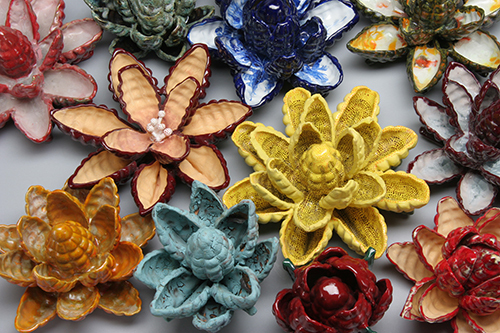 Adrianne Crane, Artillery Field, 2005, slipcast and glazed ceramic, each flower, 10 x 10 x 10 inches, courtesy the artist. Topeka, as a community, is about to gain a rare opportunity to examine cultural issues through the lens of art. Kansas is often known as a flyover state, but this time the art is landing here — and with a bang. Just as a piece of clay can be molded and shaped by the things around it, so can the human mind. Be sure to see the exhibit before putting that clay in the kiln. A program of ExhibitsUSA, a national division of Mid-America Arts Alliance with the Kansas Arts Commission and The National Endowment for the Arts. Please be advised the artwork on display may contain themes and imagery of an explicit nature, and may not be appropriate for all viewing audiences. Zoe Brown is the Editorial Assistant intern at the library. She is also a senior at Washburn University, where she is pursuing degrees in Contemporary Journalism and Psychology. Posted in Art, Press Room and tagged art, Clay, sabatini, Sculpture.